Have to be straight-up with you: I’m a total sucker for beer that comes in a box. And they know it, too, don’t they? That’s why they can charge me and others stricken with my beer-dork disease double digits to try “limited edition” rarities that come packed in protective cardboard. It’s a darn good thing that FIRESTONE WALKER and their hyped-to-the-12-galaxies imperial stout PARABOLA deserves that extra coin. I bought a bottle of this at the only place I’ve ever seen it, San Francisco’s secret beer-selling gem, MONTEREY DELI. This store – which I wrote about initially here – has stuff the other local kingpin stores just don’t get it, or sell out of too quickly. When everyone else was sold out of Russian River Sanctification, Monterey Deli had it. When everyone else was running out of “Batch 5” of Russian River Supplication, Monterey Deli had it. 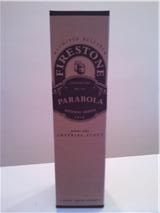 And when Firestone Walker “Parabola” was shooting up the Beer Advocate hype-o-meter, only Monterey Deli had it. 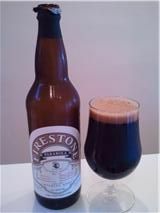 So anyways, the reason I was so hot to try this is because of how much I loved the Firestone Walker “10” some years back. That was a barrel-aged creation of the godz, and I know that Paso Robles, CA-based brewer is justly famous for their experimentation with all manner of barrels and fermentation models. PARABOLA fits into their hallowed pantheon quite nicely. Once I “unboxed” it (I thought of YouTubing the unboxing ceremony, the way people do with iPads), it poured a deep jet-black (which is good, because it’s what I was expecting in a Russian Imperial Stout). Check out this stat – 13% alcohol. Sure, you taste it a little, but not in that burning, mouth-peeling way you do with some others. Initial taste was of dark cherries and cola, with the requisite vanilla flavor that often comes through in aging. Parabola is a real smooth sipper, and it’s delicious both cold out of the bottle and warm an hour later (and yeah, I took my time with it). Believe it or not, it’s not as ridiculously complex as some big beers can go – it’s just really, really good. 8/10. I’d put out an APB if I were you on this – maybe even Monterey Deli has one.